Thanks to Righteous Pups for giving us the gift of Greg in 2013. Our beautiful autism assistance dog has changed our lives in innumerable ways. Michael was (and still is) an anxious boy with autism and moderate intellectual disabilities. 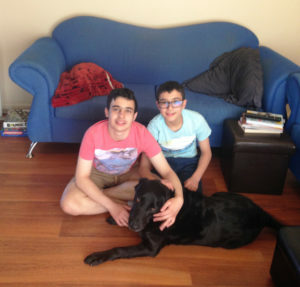 We applied to Righteous Pups for an autism assistance dog in about 2011 as we had seen a story on 60 minutes and knew immediately that this was a form of therapy we wanted to try for both our boys on the Autism Spectrum. Michael was unable to sleep alone at 9 years old. We were unable to attend a movie theatre. We were unable to go to restaurants. We were unable to attend our local church. Furthermore, Michael was an absconder-running off and compromising his safety -and at times ours! He had and still doesn’t have much sense of road safety. Greg changed all of the above and made the impossible possible. As Jenn said at our well attended fund raiser for Greg, Righteous Pups gives families touched by autism, “the chance to dream again” through the amazing work they do with these incomparable autism assistance dogs. Gabriel is 19 months younger than Michael. He also has autism. He is socially awkward but having Greg by his side has brought out his lovely caring nature. He is very affectionate with Greg. He has bad days at school where he often comes home crying. Greg is right with him when he comes home from school and senses his sadness and licks him like mad as if to say “I know, I’m here, I want to help, I’m your friend with no strings attached”. It warms my heart so much the bond that exists between these two. Friendships are still difficult for my boys but Greg is a beautiful, loyal companion. Finally, Greg helps my husband and myself. He is another weapon for us in the fight against autism. We were socially isolated as a family and autism was defining us as a family but it doesn’t any longer thanks to Greg. Greg has allowed us to do simple things that “normal” families take for granted. Please give to this amazing organisation. It and the dogs they train save lives-literally! What could be more valuable than that?